Last Saturday, the Quinnipiac men’s ice hockey team eliminated Yale from the ECAC Hockey Tournament Quarterfinals. On Wednesday, the Quinnipiac men’s basketball team did not find the same success, falling to the Bulldogs 69-68 in the first round of the CollegeInsider.com Tournament on a last-second 3-pointer from Justin Sears. Evan Conti led the way for the Bobcats with 17 points. Ousmane Drame came away with a double-double, scoring 12 and grabbing 15 rebounds. For Yale, Javier Duren scored 17 points to lead his team, as well. Matt Townsend added 12 and Sears had 11, including the game-winner. On the final possession with his team down 68-66, Sears received the ball on the right wing with an open look. He stepped back and put up a three, banking it off the glass and in with 0.7 seconds remaining. 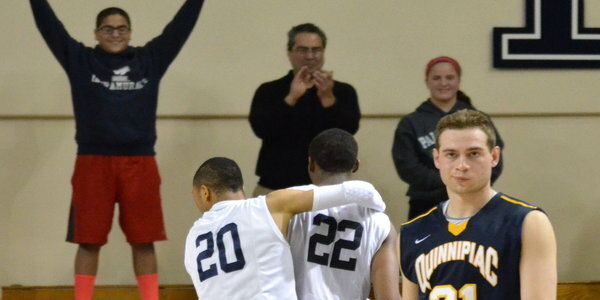 He picked off the Quinnipiac desperation inbound pass to solidify the team’s win. Yale Coach James Jones did not plan for that to be the last play, however. With 1:07 remaining in the game, Townsend was fouled by Conti. He made both his free throws to cut the lead to 67-65. On the inbound play, Kasim Chandler received the ball, but got trapped in the corner and ended up dribbling out of bounds. Sears went to work down low, but Ike Azotam forced him out of bounds. The Bobcats broke the press and advanced it beyond half court, taking the game clock down to 24.3 seconds, nine seconds on the shot clock, before calling a timeout. Chandler, again with the ball, turned it over, forcing Zaid Hearst to foul Sears on the other end. Sears hit the first attempt, but missed the second. Armani Cotton grabbed the offensive rebound, but missed the layup. Chandler eventually grabbed the loose ball and was fouled. He split his free throws to give his team a 68-66 lead with eight seconds left. This is the fourth time in the last five seasons Quinnipiac has qualified to participate in a national postseason tournament. Each time, the Bobcats have come up short. Moore feels the fanaticism of the NCAA and NIT tournaments has caused the team to lose focus when appearing in the CIT. He did not want that, however, to be an excuse for the team’s mental mistakes. Moore, unlike Jones, did not use much of his bench, especially in the final stretch. Noting the injury that had decimated his team during the season, he relied mostly on his starting five and Chandler off the bench. “He used a lot of guys and a lot of guys helped him,” Moore said.